What do coffee and banana have in common? One is a cash crop and the other is a food crop. According to scientists working at increasing food production to enhance food security to meet the growing population and adapt to climate change, the two crops make a perfect marriage. A study by the International Institute of Tropical Agriculture (IITA) and partner organizations showed that farmers get more income from growing coffee and banana together than growing either crop alone. The study, conducted in seven districts in Uganda, showed that when farmers intercropped banana with coffee in their fields, the coffee yield remained the same–despite a reduction in the number of plants to make room for the banana–and the farmers gained additional income from the banana. According to Piet Van Asten, IITA scientist and one of the researchers, the findings showed that fields with coffee and banana growing together generated over 50% more revenue than the coffee or banana growing alone. In the Arabica coffee-growing region around Mt. Elgon, annual returns per hectare averaged US$4,441 for coffee and banana growing together compared to $1,728 and $2,364 for monocropped banana and coffee, respectively. In Robusta-growing areas in South and Southwest Uganda, annual returns per hectare averaged $1,827 for coffee and banana, $1,177 and $1,286 for sole banana and coffee. “These results were spectacular; coffee yields did not decline when intercropped with banana compared to when grown alone. Therefore, all revenue generated by the banana was a bonus to the farmers,” he said. Intercropping of coffee is not a very common practice in some countries; it is even discouraged altogether for fear that it will reduce coffee yields. 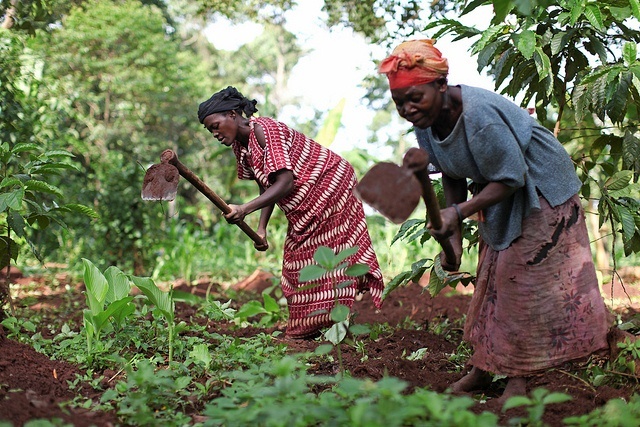 However, farmers in Uganda, especially in densely populated areas, have carried out this practice for many years. Van Asten said that the two crops complement each other. Coffee plants love shade that is provided by the much taller banana. Also potassium is an important nutrient for both crops, and the intercropped coffee, on average, seemed less potassium deficient than sole coffee. Socioeconomically, banana provides farmers with food and a modest but continuous cash flow throughout the year, he added. Coffee gives considerably more income through cash bonuses twice a year for farmers to purchase more expensive items such as farm inputs and equipment, improve their shelter, and meet family obligations such as paying school fees for their children, among others. Coffee is an important cash crop for countries in the Great Lakes where it is a major source of foreign exchange revenue and income earner for smallholder farmers. Banana, on the other hand, is an important staple produced all year round. Working under an initiative named Consortium for Improving Agriculture-based Livelihoods in Central Africa (C IALCA), Piet Van Asten and his colleagues urge farmers to not only put banana in their coffee fields but to also put coffee in their banana fields. Hda las vegas en la zona andina de colombia es otro ejemplo. Se tienen 4000 sitios de banano COCOS asociado a cafe dispuestos en hileras cada 16m m , Se producen mensualmente unos 3500 kg de fruta sin afectar el rendimiento del cafe. Bonjour et merci pour cette nouvelle initiative d’accorder le café a la banane. Ne serait t-Il pas possible d’ajouter le cacao oubien le bicacao et la banane plantain et meme plus,Tel que fruits, légumes ,Riz, mais, vivres alimentaires, tubercules, palmiers a huile, hévéa? Hello,i am writing a book called Buganda,Buganda now called Uganda about the culture, beliefs and rituals about the Baganda, Can I please have permission to use the image taken by Ms Elizabeth Pohl about banana and coffee growing together inmy book? i love coffe. thanks for your share it.